5G is being lauded as the next big innovation that will transform the broadband marketplace overnight, solve all our mobile bandwidth woes, and drive the coming Internet of Things (IOT) revolution. All this excitement has also resulted in some serious misconceptions — namely, that 5G will replace the need for fiber-optic broadband networks. Far from being replaced by new 5G wireless technology, fiber networks are the critical underpinning that will power 5G and other wireless technologies. 5G stands for fifth-generation cellular wireless: new, better mobile internet that will one day replace the standards for current 4th generation mobile networks. 5G standards have not yet been codified, but the technology is expected to be a game-changer due to vastly reduced data transfer delays (instantaneous machine to machine communication), and the capacity to transfer enormous quantities of data back and forth. These capabilities will supercharge the IOT industry, bring true autonomous vehicles much closer to reality, and could enable innovations like remote medical surgery and a host of smart city and public safety related applications. But there is a catch: 5G will operate over a range of spectrums, including very high frequencies that can carry significant amounts of data, but only for short ranges. In practical terms, we will need a dense network of 5G antennas (small cells) to ensure proper coverage. While the cells are called “small” because the service is small, the device itself is rather large — about the size of a refrigerator, with a maximum range of around 500 feet, so tens of millions of these refrigerator-sized devices will be required every few hundred feet to power a truly ubiquitous 5G network. Why do we still need fiber? 5G networks still need extensive land-based fiber systems — far more extensive systems than required by existing 4G technology. Each of the small cell antenna sites needs to be connected by fiber-optic cables. The Fiber Broadband Association estimated that 1,390,816 miles of fiber will be required to build out just the 25 biggest metro areas in the United States, which does not include coverage for the millions of residents in smaller urban markets—let alone those in rural communities. In addition, while 5G will operate over frequencies capable of transmitting larger amounts of data, the signal can only travel 10% of the distance of a 4G signal, and does not penetrate physical obstructions such as walls and vegetation. This means each antenna will only cover a diameter of roughly 750 feet, compared to current 4G coverage diameters of 3.5 miles. So again, millions of these devices will be required to provide connectivity — a solution that will not always be the ideal replacement to fiber-to-the-home. The image of the left shows the range of a single 4G macro cell — 10 square miles. 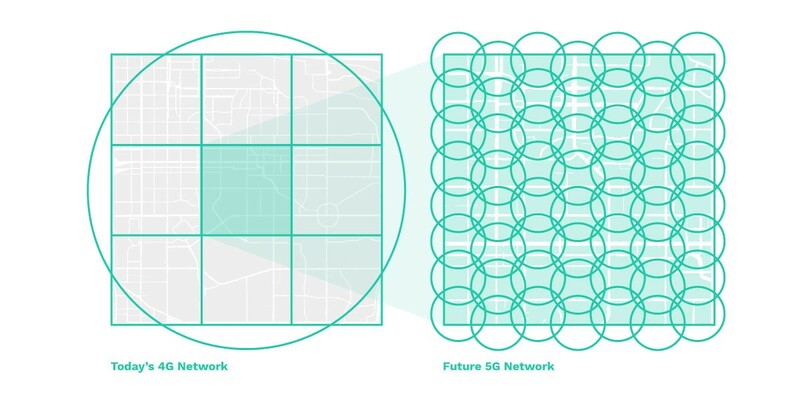 The image on the right shows approximately how many 5G cells would be needed for just a single square mile from the first image. 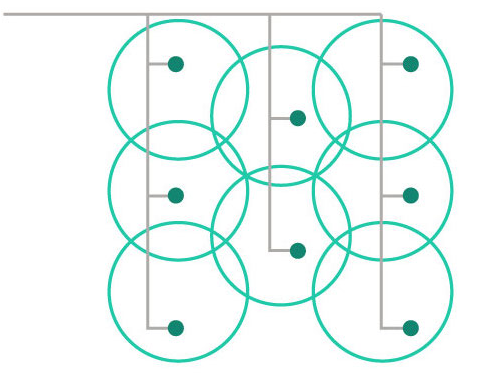 Each of these small cells will require fiber connections. So, fiber networks will provide the essential connection between antenna sites, and fill the gaps in residential 5G coverage. In addition, fiber networks will be essential to realize smart city visions around the country: from connected sensor networks on traffic signals that set red light wait times based on real time traffic patterns, and create ‘green light corridors’ for emergency vehicles, to connected sensors on water meters that identify water leaks more efficiently than dispatching inspectors. Smart city applications will be as endless as our imaginations, and will only grow as new sources of data and ways of applying it come on line. All of these solutions will be dependent on robust and widespread fiber networks. Why can’t we rely on service providers to build this massive fiber network? Despite significant federal and state subsidies over the past few decades, incumbent service providers have failed to provide equitable, reliable, and affordable broadband access. It should be no surprise then, that they will continue to focus their capital expenditure (CapEx) on new technologies in the markets where they can generate the greatest returns. This means that non tier one markets, and all of rural America, will be left behind as denser urban areas begin to reap the benefits of next generation connectivity. This coming revolution, and the ensuing coverage gaps, represent an opportunity to demonstrate what can be achieved with open access fiber networks, built with and for communities, designed from the outset to support 5G and any other type of service that requires connectivity. From advanced telemedicine to the smart city applications of our dreams, we need robust and widespread fiber networks to make them a reality. More than 15 years designing & building large area broadband networks and now leads the broadband group at Neighborly. Passionate about connecting people.